The Nativity is one of Christmas’ most enduring stories, and the delicacy and charm of this special event is observed, or participated in, in countless churches, chapels and schools up and down the Country. 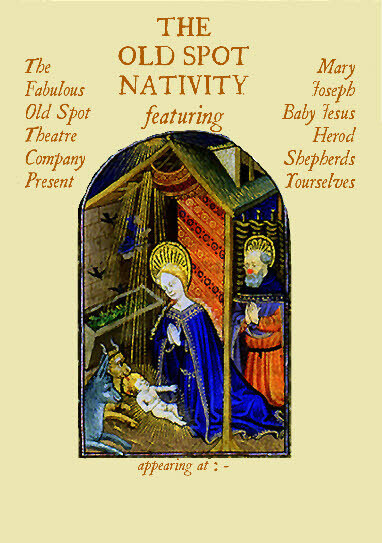 The performers of our version of the Nativity are Gloucestershire shepherds, who seem to have a knowledge of events that only actually being there when it happened could explain it. They are hard working pracical men, used to living n the fringes of society, but they have a message to bring and promises to keep. The show itself is part Medieval mystery play, part folk drama Mummer’s play , part clown show,part play group infants production and the appearence of many sheep and a real angel are guarranteed. It brings out , for all the right reasons, tears and laughter. This show is regularly revived and is available on request. If enough bookings come in, we will be pleased to perform it for you. Last performed for a run at the New Brewery Arts Centre in Cirencester, the heart of sheep country. The show lasts approximately 1 hour 20 mins. Told with humour, reverence, and one eye out for the Romans, a group of Cotswold shepherds explain, as best they can, their role in this timeless story, as well as those of the Magi, The Holy Parents, the Arch-villain Herod and Simeon and Anna. The result of the story is never in doubt, in that bleak midwinter, long, long ago, but why are the shepherds there in the first ,and what are they doing now, and why is Herod in such a tizzy and who on earth is Merry Andrew ? This show is mean’t for small people, from five upwards, as well as their carers, brothers, parents ,sisters, grand-parents ,school chums and friends too.